Tani may have been too old to be playing with the young mermaids around her, but she didn't seem to care. 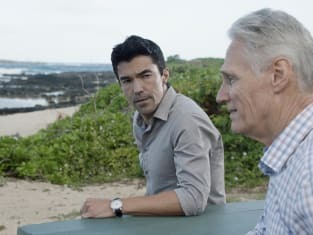 Hawaii Five-0 Season 9 Episode 16: "Hapai Ke Kuko, Hanau Ka Hewa (When Covetousness is Conceived, Sin is Born)"
Tani [to Danny]: Women are just as capable of using a gun or a knife. Hey, this is my favorite kind of sandwich -- free. Permalink: Hey, this is my favorite kind of sandwich -- free.